A few weeks back I was approached by Sophia of Chew On That to do a guest post on her blog. The subject-matter was a tea time snack and I decided to do a Malaysian favourite. 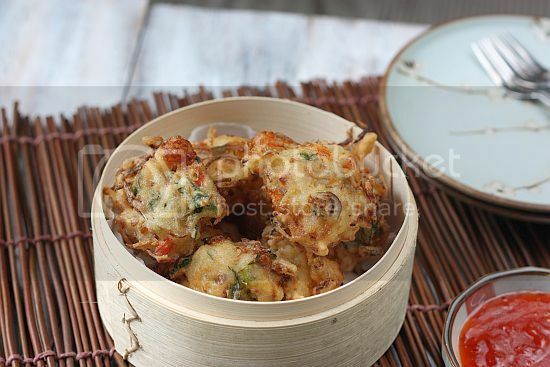 Cucur Udang or Prawn Fritter is one of the all time Malaysian favourite tea-time snacks. These fritters are usually made one or two bite size and therefore makes great finger food. They are crunchy on the outside and the inside is soft and moist when you bite into it. I have used prawn in this particular one but sometimes the ingredients can be varied to include anchovies, thus calling it Cucur Ikan Billis or Anchovy Fritter. You could also use corn kernels as another main ingredient. These fritters can be found commonly at road-side street carts in Malaysia, in the day time and even at night markets. 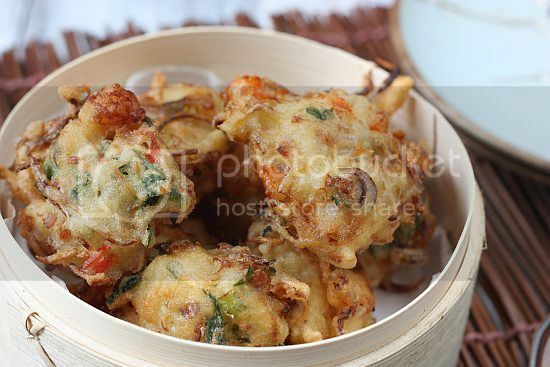 The ones sold outside are usually round and if they are prawn fritters, a small prawn with it's head and shell intact, is placed on top of the batter before being fried. Visit my post at Chew On That to get the full Recipe for this delicious snack. Oooooh Jo!! These snacks look so appetizing & tasty too! Nice post at least I think so. Thanks a lot for posting that info.